Interstate 695 follows the Throgs Neck Expressway, a short connector between I-295 (Throgs Neck Bridge) and I-95 (New England Thruway) in Bronx, New York. Interstate 695 was a part of Interstate 295 (a spur much like Interstate 270 in Maryland) and known as Spur Interstate 295 until 1986. This spur designation explained why Interstate 695 was not included in the official Route Log and Finders List until December 31, 2014, as the mileage was attributed to I-295. The Throgs Neck Expressway opened in 1961 and was included as the easternmost extent of Interstate 78. When Interstate 78 across New York City was cancelled in 1971, the Cross Bronx Expressway Extension, the Clearview Expressway and Throgs Neck Bridge were signed as Interstate 295 and the Throgs Neck Expressway was designated as Interstate 295 Spur. Interstate 695 replaced Spur Interstate 295 in 1986. A previous alignment for Interstate 695 in New York City was reserved for the unconstructed route of the Queens Interborough Expressway from the proposed Cross Brooklyn Expressway (I-878) north to the Brooklyn-Queens Expressway (I-278) in Queens. This was designated by AASHTO on June 23, 1969. For more information on I-695, visit Throgs Neck Expressway (by Steve Anderson). Older guide signs along I-95 south referenced the Throgs Neck Expressway as Interstate 295. Prior to 2002, the FWHA Route Log and Finder List included the mileage of I-695 with I-295, classifying the route as a spur. Vidcap taken 09/93. An end shield for I-695 stands at the wye interchange where the Throgs Neck Expressway merges with Interstate 95 (Bruckner Expressway) north. Photo taken 08/09/04. Former button copy sign posted one mile ahead of the southbound split of Interstates 95 and 695 at the Wilkinson Avenue overpass in Bronx. This sign predated the designation of I-695 along the Throgs Neck Expressway. Historically the freeway was considered a spur of I-295, and before that a spur of Interstate 78. Photo taken 08/29/05. The Throgs Neck Bridge represents the easternmost connection over the East River to Long Island from New England and points north. I-695 leads south to become Interstate 295 ahead of the toll bridge and Clearview Expressway through east Queens. Photo taken by 08/29/05. 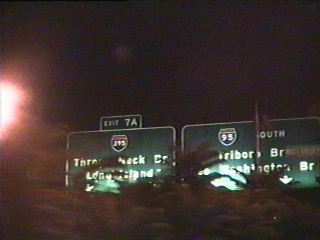 This button copy sign directed travelers onto Interstate 95 (Bruckner Expressway) west toward the George Washington Bridge at the south split with I-695. Photo taken 08/29/05. The only exit along Interstate 695 south departs for Randall Avenue after the initial confirming shield. Photo taken 08/29/05. Shield markers posted along the Throgs Neck Expressway for Interstate 695 include trailblazers for I-295. This assembly is posted after the Randall Avenue interchange. Photo taken 08/29/05. The lone indication that southbound Interstate 695 comes to an end is a standalone shield preceding the wye interchange with Interstate 295 (Cross Bronx Expressway Extension). Photo taken 08/29/05. A lane drop occurs as Interstate 695 merges with the left-hand side of I-295 ahead of the off-ramp (Exit 9) for Harding and Pennyfield Avenues. The Throgs Neck Bridge toll plaza follows. Photo taken 08/29/05. After crossing the Throgs Neck Bridge, northbound Interstate 295 splits with I-695 and the Throgs Neck Expressway for the Cross Bronx Expressway Extension west to the Bruckner Interchange. Photo taken 08/09/04. I-295 leads motorists west to I-95 to Upper Manhattan and New Jersey via the George Washington Bridge. Interstate 695 continues the Throgs Neck Expressway north to Interstate 95 (New England Thruway) north. Photo taken 08/09/04. The first confirming marker for Interstate 695 appears north of the Lafayette Avenue on-ramp. Photo taken 08/09/04.